Every autumn, in the Arctic archipelago of Svalbard, polar bears build dens to give birth and nurse their young through the first days of life. Knowing how many cubs are born – and where their dens are located – is critical to understanding the status of the bears as they face a future of rapidly decreasing ice. When the polar bears of Svalbard venture from their dens this year, a joint expedition of WWF-Canon and the Norwegian Polar Institute will be there to observe how the bears are adapting to changing sea ice conditions. The WWF-Canon expedition comes only weeks after the maximum extent of Arctic sea ice was found to be at its fifth lowest level in the satellite record. A recently published paper also suggests that the Svalbard expedition area will be ice-free in summer by 2050. There is some evidence that the Svalbard population is moving away from traditional denning sites on the Norwegian islands. 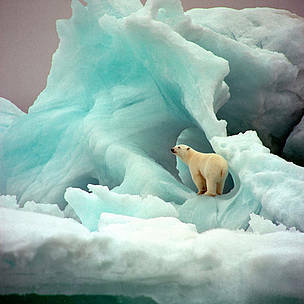 The bears need to be close to sea ice to hunt when they emerge from their dens. One possibility is that they are moving further east where the ice survives longer. NPI researchers will place satellite collars on female bears so that they can track their travel over the next year. Comparing the position of the bears to satellite information about the sea ice will help explain how polar bears are responding to ice conditions and how they might adapt to future changes. 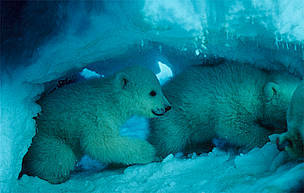 The expedition is sponsored by Canon Europe, Conservation Imaging Partner of WWF International. Canon has a longstanding partnership with WWF that goes back over sixteen years, using imaging expertise to help WWF record and promote awareness of the state of the environment and climate change. Canon is supplying photographic equipment for this project and sponsoring a leading Swedish wildlife photographer and Canon Ambassador, Brutus Östling, to capture images of the wildlife encountered along the way. Polar Bear cubs in den, Svalbard, Norway. Polar bear (Ursus maritimus) in blue ice. Bukta Tikay, Franz Josef Land, Svalbard, Spitsbergen, Norway.